Victoria Forms supply an advanced eForms System specialised for Revenues, offering a decade of experience, expertise and reliability in this specialist area. Central to the Victoria Forms Revenues solution is a library of over 80 ready-made Council Tax and Business Rates forms which are consistently updated in line with legislation. All eForms are branded for individual authorities, and with additional design work, aspects of any of our ready-made eForms may be further customised if required. eForms are launched and managed within the powerful management application, Enterprise Forms Server, and received eForms can be exported to PDF and TIFF image files as part of the base solution, and then integrated with EDRM systems. Adaptable additional modules ensure customers can select functionality that will offer most benefit to their individual working processes. 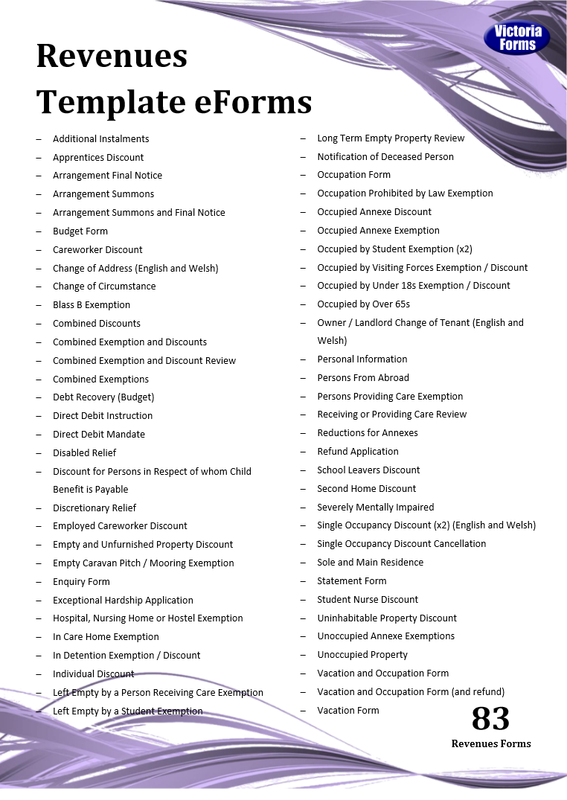 This application form allows claimants to select one of 29 reasons for claiming a Council Tax Discount or Exemption. On the first page of the application form, the applicant can fill in basic details about themselves and then select whether the property they are claiming reduction on is occupied or unoccupied. This will then bring up the exact discounts/exemptions they can apply for from the list below based on the occupancy of their property. On selecting the exemption they wish to apply for, the correct and relevant pages then open up for the claimant to complete. The entire form is 38 Pages, although the final form will vary depending on answers given—for example; if a claimant said they were a school/college leaver, the form would appear to them as a simple 5 page form. 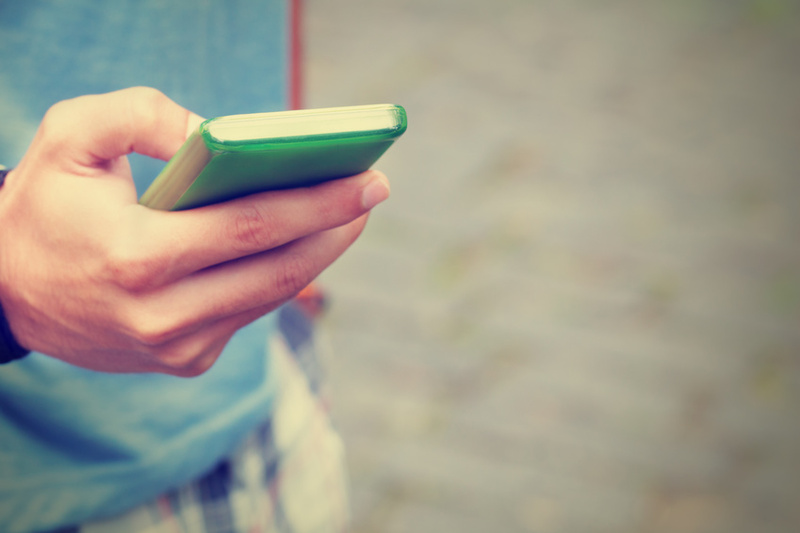 Our online Direct Debit Instruction is easy to complete, and conforms with the Direct Debit standards accepted by most banks. 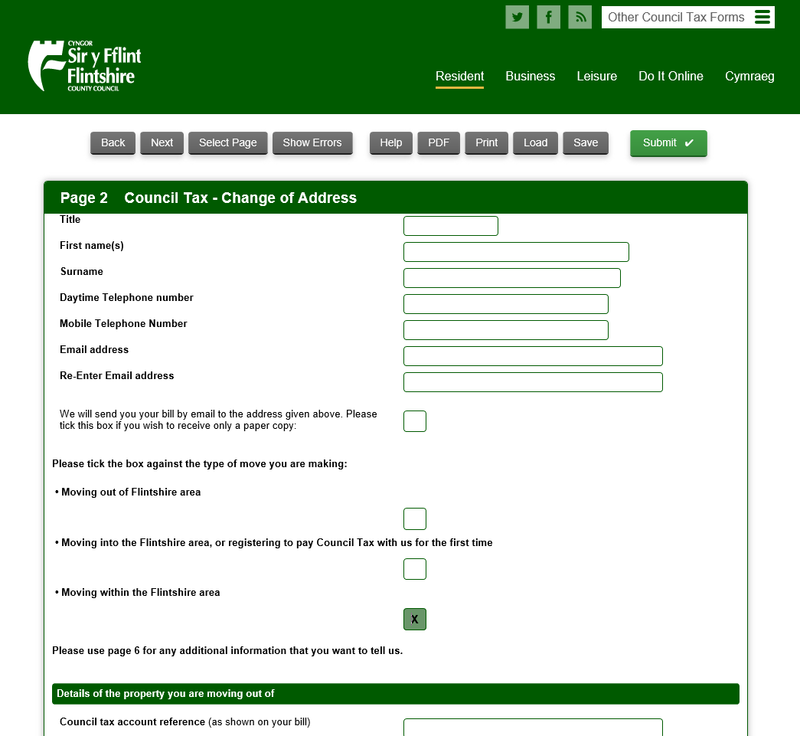 The PDF export of the Instruction is laid out on an A4 page, which can be saved or printed by the Council Tax holder, for their records. Direct debit integration allows our forms to automatically update your back office system with any new direct debit instructions submitted by the Council Tax account holder. Advanced Northgate Integration validates the account by checking the Council Tax reference, and can then update the account record with details provided on the form and update the instalment plan. Optional further integration allows temporarily suspend accounts so billing does not occur while the Direct Debit is being implemented. Direct Integration into Capita Academy eStore is currently being developed. Also known as Single Occupancy Discount or Sole Resident Discount; Single Person Discounts can be applied to accounts with minimal intervention with our automated integration option. 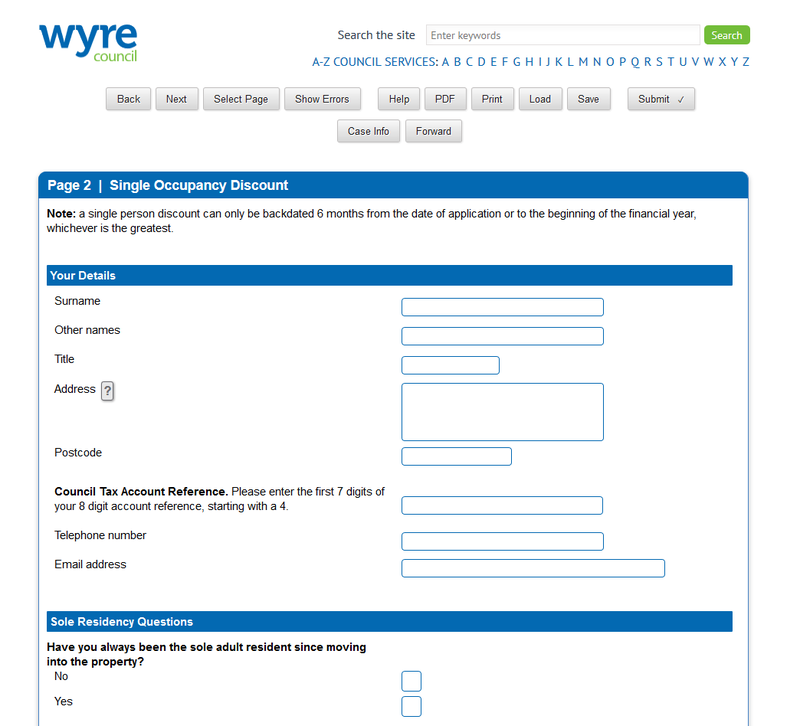 Two separate ready-made forms are available for adding or removing Single Person Discount to/from a Council Tax account. With integration, the discount can automatically be applied to an existing account, or in the event of household members moving out, the integration will close the currently open account, removing any occupants, and create a new account with the person applying for the discount as solely liable for Council Tax. 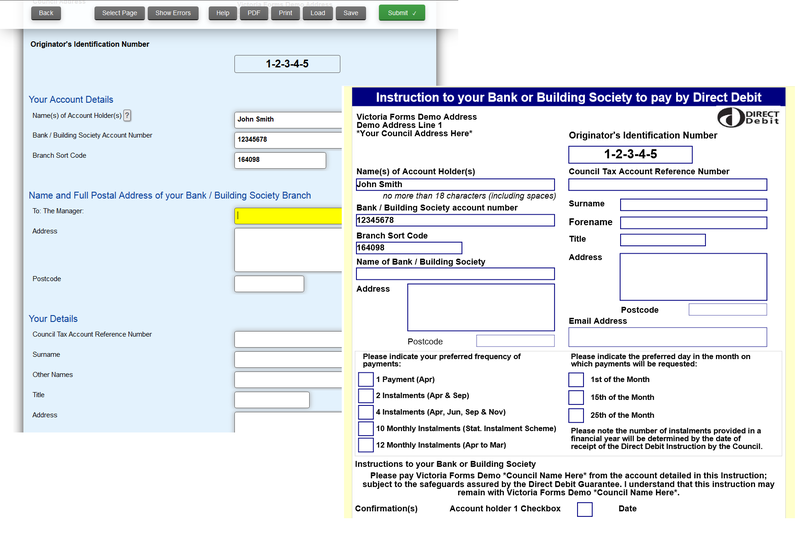 This intelligent form caters for three different types of address change – moving out of; moving into; or moving within the Local Authority area. The applicant simply selects one of the options at the start of the form, and the subsequent questions are tailored to ask relevant questions for the type of move. Integration deals with any discounts or changes in council tax liability automatically – updating the relevant accounts according to Local Authority policy. Furthermore, the integration can be highly customised, allowing the Local Authority to decide how any change in status is handled, or how any discounts are applied. 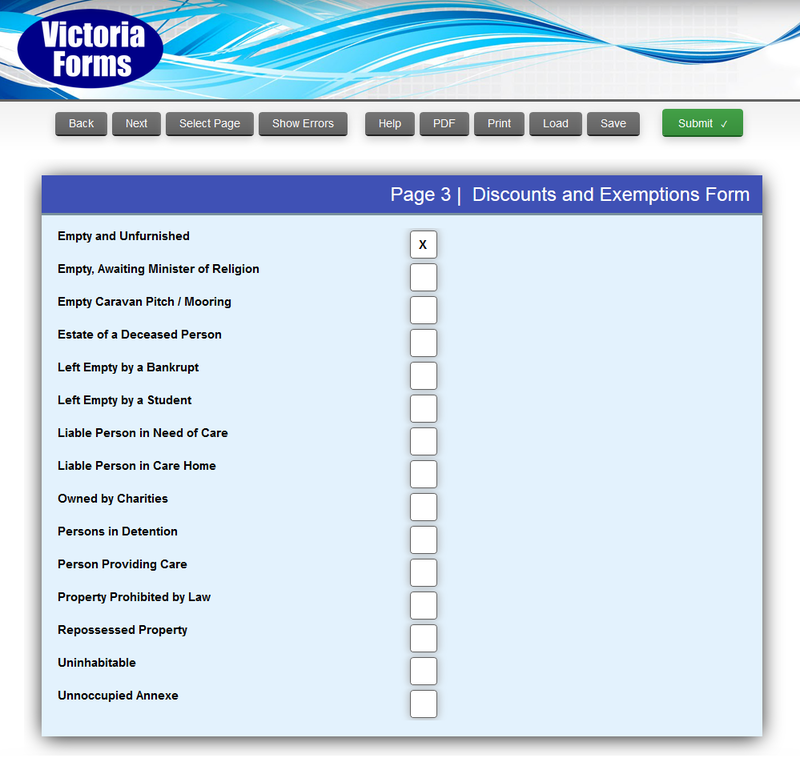 Victoria Forms supply a library of over 80 ready-made forms designed specifically for revenues departments, with forms designed for both Council Tax and Business Rates. Our libraries are kept up to date as regulations change and improvements are identified, and new eForms will also be added to the libraries where our customers identify a need. Our ready-made forms can be instantly branded to your authority; with corporate colour schemes, local authority name and contact details, meaning you can get up and running with online forms quickly and easily. Direct Back-Office integration is available into Northgate (Advanced Northgate Automation) and Capita back-office systems. Advanced automation allows the form data to be used to update the customer account within Northgate, to suspend billing or add custom notes for example. 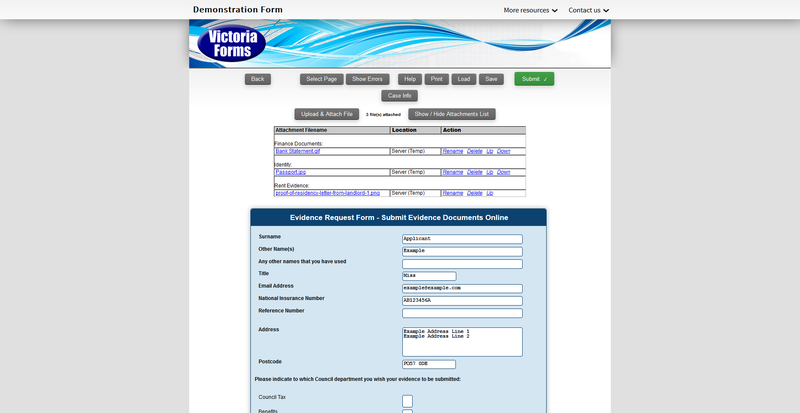 Councils using Civica Back-Office systems are welcome to contact Victoria Forms to develop an integration solution. Using a snapshot of a back office property database, or a service such as Gazetteer, an address lookup functionality can be added to any eform to help customers or assistive members of staff quickly find a valid address. The address lookup service also provides a Unique Property Reference Number (UPRN) to accompany the property address, which helps with direct XML integration into Back Office Systems such as Northgate, which may require manual intervention without the UPRN. Use the Attachments module to collect evidence to accompany Council Tax and Business Rates form submissions – such as Doctor’s Certificates or proof of age for Council Tax Exemptions & Discounts. The Attachments Module can be used on any form, which easily allows customers to upload certain documents as evidence to be submitted alongside their form, saving time and keeping all documents together. Victoria Forms supplies a validation tool which can be incorporated into any form, enabling you to benefit from real-time modulus checking of account details via up-to-date third party web services, minimizing the risk of non-payment. This tool can be used to ensure that the correct sort code and account numbers have been supplied first time, saving time and money. Importantly, it will check if the account in question is direct debit capable. The Enterprise Forms Server is the core system for forms administration. It handles hosting of forms, user access to blank and filled forms, and processes completed forms. A number of Add-On Modules are available to further enhance the functionality and usefulness of the system, tailored to your needs.